What are the differences between the various Indexes -- .HHK (HTML Help), .HxK (MS Help 2) and the embedded Help Viewer Index. The source to these examples can be downloaded at the end of this post. Compiling to .HxS Help. Everything works much the same. My experimental links to 3rd level Keywords and to popup Keyword items failed (in fact the compiler didn't even include them). 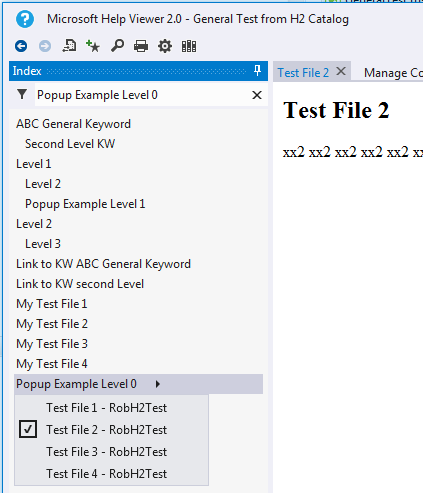 In MS Help 2 the popup items show up in the "Index Results" pane. Even my 3rd level popup showed OK. I used mshcMigrate.exe to export my HH project (.hhp) and H2 project (.HxC) to .mshc help. 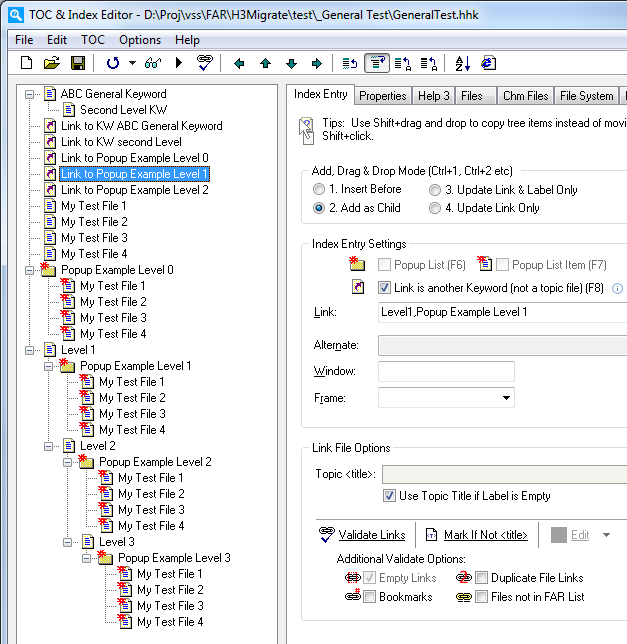 Note I could also export .chm but the .hhp project file contains richer info (we can get to the index file data etc). Here I've created a separate collection (See read me in the example zip) so we can see just our helps index items. Clicking the Links to Keyword items take you directly to the topic instead of moving the list selection to the target keyword. This is because HV does not support Linking to Keywords. And mshcMigrate does a work around by turning the Keyword Link into a normal link. 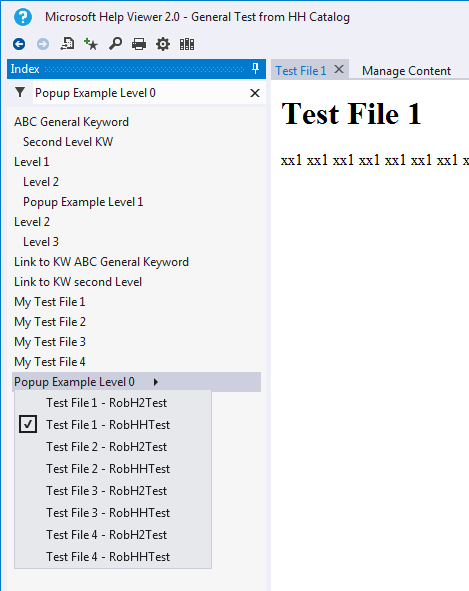 Popup Items -- The VS 2012 viewer shows a popup with current page checked. 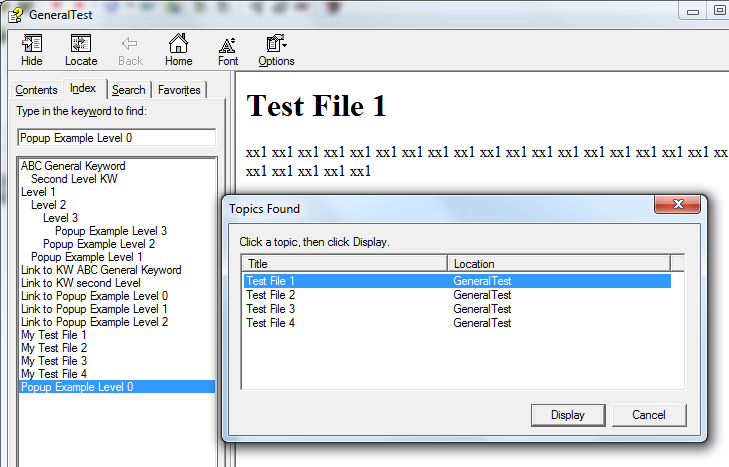 Again the popup items are populated by the topic <title> tags. Popups buried more than one level deep are not supported. 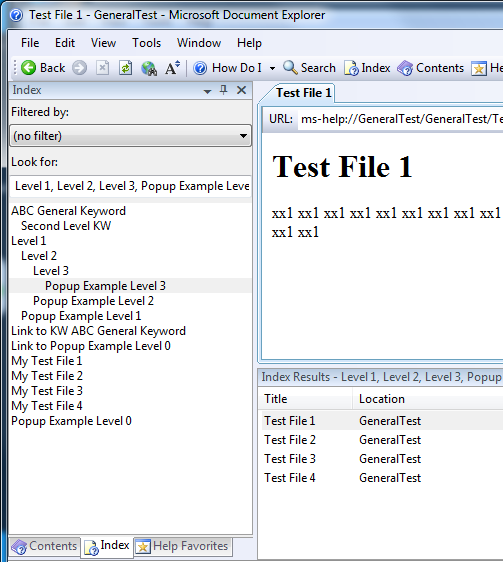 The existing popups work OK.
HV only supports 2 levels of index. You can see mshcMigrate has had to do some work in getting the Level 3 item to display at Level 2. Here I got some strange results re popups -- which I will need to check out. It could be because I included Level 2 and 3 popups etc. I would have expected the Indexes from HH and H2 to be the same.